Inspired by nature and perfected by advanced technology. Skin Activator™ works to re-hydrate, nourish, firm and protect your skin. Fine lines and wrinkles, smoothness, clarity and luminosity may visibly improve in just a matter of weeks. But that’s not all. Skin Activator™ also cleverly targets those annoying age-prone areas of the skin by giving you 5 timedelaying products to choose from. Each is designed to be skin area specifi c and active where it is needed most. Help regain a more youthful, smoother looking skin with this light, quickly absorbed moisturising lotion. Skin is instantly hydrated and also benefi ts from SPF 15 protection. Use every morning to help reduce the appearance of fine lines and wrinkles; and to help improve the clarity and luminosity of your skin. Oval tube 50ml. A luxurious, ultra-rich night cream that helps to rejuvenate the skin whilst you sleep a time when cell renewal is at its most active. Supports collagen production and hydrates and nourishes the skin. Used regularly, it may visibly increase luminosity and clarity and also help to improve skin fi rmness. Recapture your youthful look. Jar 50ml. lines and wrinkles and leave your skin feeling silky soft and smooth. This super softening lip cream contains SPF 15 protection and is subtly fused with peppermint to keep your lips moisturised and protected. Helps to reduce fi ne lines around the mouth, and helps lips to feel smoother and look fuller. "Have you applied your vitamins today?" Looking and feeling your best means nourishing your body inside and out. That's why Herbalife created Nourifusion. 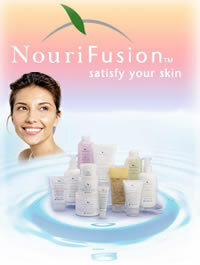 The NouriFusion line combines the best of science and nature to help give you beautiful, healthy-looking skin. Made with vitamins A, C, and E and skin-enhancing herbal ingredients, NouriFusion is ACE for your Face! Rich, hydrating formulas specially created for a normal to dry skin. This is a simple three-step regimen for beautiful, healthy-looking skin. The System includes NouriFusion™ MultiVitamin Lotion Cleanser, Toner and Moisturizer SPF 15 for Normal to Dry skin in one convenient package. This rich, gentle cleansing lotion removes makeup, dirt and oil. Contains special botanicals to keep dry skin feeling clean yet moisturisd. Rich cleansing lotion specially formulated for normal to dry skin. Leaves skin feeling moisturized, soft, smooth and supple. This light, refreshing toner freshens skin and helps remove excess residue, dirt and oil without drying. It opens up pores and leaves your face feeling moisturised and refreshed. Take care of your skin right with this creamy, rich day lotion fortified with SPF 15 UVA/UVB sun protection. Hydrates your skin so it feels soft and smooth, then protects your face from ordinary, daily sun exposure throughout the day. Light, non greasy formulas specially created for normal to oily skin. This is a simple three-step regimen for beautiful, healthy-looking skin which protects skin and improves tone. Includes Normal to Oily Foaming Gel Cleanser, Toner and Moisturizer SPF 15. This lightweight, foaming gel cleanser helps improve skin texture, tone & firmness, as it cleanses and removes makeup, dirt and oil. Prevents blemishes from occurring and targets oils without sabotaging skin’s protective moisture barrier. This light, refreshing toner helps remove residue while controlling oily shine. It helps improve skin’s texture, tone and firmness, leaving skin feeling clean, revitalized and non greasy. This lightweight moisturiser hydrates and protects skin without feeling greasy. Offers broad spectrum UVA/UVB protection against ordinary, daily exposure to the sun’s damaging rays. Light day moisturizer protects and controls shine. Gentle, revitalizing facial scrub removes dead, rough, dull skin. Exfoliant polishes skin, leaving behind a clear complexion. Removes impurities that leave skin looking dull. Lightweight clay mask removes excess oil. Absorbs impurities and improves skin texture and tone. Leaves skin clean, clear and glowing. Skin cells replace themselves faster than any other cells in the body, and do most of their self-repair at night. This contains the nutrients your body needs to facilitate healthy skin renewal. Rich yet light in texture, it provides skin with longterm moisturization. Apply it every night and awaken to soft, supple skin each morning. Deep hydration for dry parched skin. Luxurious whipped mask gently cleanses, soothes and moisturizes. Improves skin complexion while it softens and smoothes. Helps reduce the appearance of dry, flaky skin. Eyeliss™* technology reduces under-eye puffiness. Offers light moisture and instant cooling sensation. Skin around the eyes will feel fresh and revived. Eyeliss™ is a breakthrough ingredient that reduces water retention around the eyes, leading to a visible reduction in puffiness. Don’t live with that tired look any longer! Rich moisture for delicate eye skin. Softens and moisturizes delicate skin around the eyes. Helps increase skin firmness around the eyes. Free radicals can damage your skin, causing it to look dull and lifeless. Antioxidants help neutralise the effects of oxidative stress, helping the body neutralise free radicals. The best-known antioxidants are vitamins C and E. The entire Radiant C product line is infused with vitamins C and E, so you’ll see results that help make a difference. Use each morning to help protect your complexion from the ravages of stress and pollution, applying the light silky formula as a base before moisturizer and makeup. A gel-cream formula that visibly improves skin's texture and helps brighten dull, tired-looking skin. Use it every morning under make-up to minimize effects of stress, fatigue and pollution. Radiant C™ Daily Skin Booster delivers the antioxidant power of vitamin C directly to skin for a healthier and more radiant appearance. Help seal in your skin’s own moisture, so it feels like silk! A rejuvenating spray of moisture-rich droplets that soothe thirsty skin, refine skin texture and revitalize your spirits. It's a refreshing, fragrant, anytime burst of moisture that acts like a natural air conditioner. Just close your eyes and spray to release tiny, rejuvenating droplets. It's water-based so it won't harm hairstyles or clothing, and it actually helps make-up stay on longer. Radiant C Daily Facial Scrub Cleanser is a gentle facial cleanser that can be used by all skin types daily to help achieve beautiful, healthy looking skin. This citrus-scented gel cleanser contains jojoba/beeswax beads and a stable form of vitamin C, which provides a thorough cleansing. Orange peel extract and lemon peel oil help balance the production of sebum, while lemon peel oil also exfoliates and enlivens the complexion. It also gives it a fresh citrus scent. Ylang Ylang helps soften and smooth skin. Radiant C Body Lotion SPF 15 is a daily body lotion that provides UVA and UVB protection to defend against the sun’s damaging rays. A non-greasy and lightweight formula, Radiant C Body Lotion SPF 15 absorbs quickly, leaving your skin softer and smoother. It offers protection for softer, more beautiful skin – the antioxidant powder of Vitamins A & E plus SPF 15. Cellulite, dimply hips, lumpy thighs-even thin people deal with these problems. Now there's a way to fight back. Using the latest advances in skin care technology, our product development specialists have discovered a new way to reduce the appearance of these swim-suit deterrents. Body Contouring Creme uses multiacids from fruits and plants, Phytic, Citric and Tartaric, together with other specially combined ingredients to help improve skin's texture and tone. 200 ml. Designed specifically to soften and smooth skin, this lotion helps accelerate skin's natural process of exfoliation. For optimal results with Body Contouring Cream, first cleanse with Body Buffing Lotion. Dermajetics® Body Contouring Cream and Body Buffing Lotion are the perfect outer products to complement the Thermojetics® Weight-Management Program. Simple to use, this powerful and effective duo combined with good eating habits and exercise will have you feeling great in your swimsuit in no time!